7575 North Loop 1604 W.
Swimming pool experience we bring to the table—and to your backyard! Choosing a San Antonio inground pool contractor? 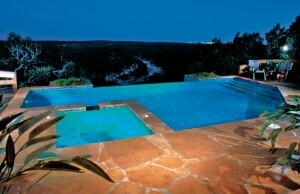 Consider the stellar qualifications you can have with Blue Haven Pools San Antonio. Since 1981, Blue Haven has completed more than 5,000 backyard resorts for clients throughout central and south Texas. With a combined 360 years of experience in the gunite-pool trade and over a dozen local and national design awards, our team has the skill to tackle most any project. Blue Haven is a long-time member of the Greater San Antonio Builders Association and has been a member of Angie’s List since 2005. We maintain an A+ rating with the local BBB as well. Our operation is an authorized warranty station for Hayward, one of the biggest international pool-equipment manufacturers. Our in-house techs can expertly service and repair Hayward pumps, filters, cleaners, and automation systems. Additionally, our team includes members with a Residential Appliance Installer Electrician license and a National Swimming Pool Foundation Certified Pool/Spa Operator) designation. Two of our superintendents also hold Occupational Safety and Health Administration certifications. With the depth of our technical skills and rock-solid financial stability, developers and general contractors continually tap us to construct aquatic projects for local motels, hotels, resorts, YMCAs, apartments, and community associations. From guests of the downtown Grand Hyatt to the San Antonio Spurs at their training center, thousands of people at numerous public and community facilities swim in pools built by Blue Haven. As our client, you will also have the benefit of a pool-construction operation run by certified professionals: Not only are we a member of the Association of Pool & Spa Professionals (the national trade organization for swimming pool contractors) two of our team members—including our owner—hold its high distinction of Certified Pool Builder (CPB). Pool professionals must meet stringent standards to qualify for this top-level CPB designation. Along with a minimum of five years of pool industry work experience in the field, they must adhere to specified ethical codes. Candidates must pass an in-depth test to prove their knowledge and expertise in business and technical areas ranging from plumbing and hydraulics to pool codes, permits, and regulations. From a basic lap pool with a Texas Longhorn mosaic decorating the pool floor, to a grand infinity pool and spa combo that are illuminated by elevated fire bowls and multicolor LED lighting, we can capture the kind of style and functionality you want in an aquatic playground. 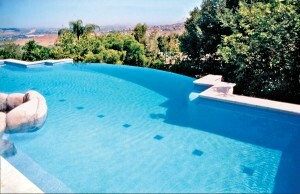 See some examples of our new pools here. We can also develop a total plan for your outdoor space. Whether you would like an outdoor fireplace, a stone walkway through your side yard, a charming gazebo for alfresco dining, a complete outdoor kitchen, or a permanently covered pavilion to serve as an outdoor living room, we can deliver—and do so with most everything on one contract! Our team performs top-to-bottom pool renovations and modernizations as well. Along with new water- and energy-efficient pool equipment, your remodeling package can also include a chlorine-to-ozone conversion and VGB main-drain safety upgrade. You are also welcome to visit our San Antonio pool design center that’s open Monday through Saturday. With nearly 3,000 square feet of space, there’s plenty of room for the full line of pool equipment on display for clients, as well as for the large display of glass and ceramic pool tile. And you can browse selections at our in-house stone yard for coping, decking, waterfalls, and other hardscape and decorative features. 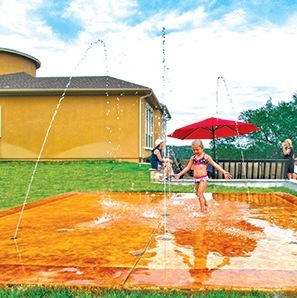 Blue Haven San Antonio offers a unique backyard amenity that creates the experience of a miniature aquatic park, known as splash pads. These special poured pads of concrete, ranging from 500 to 2,000 square feet, are plumbed to create arcing sprays of water your children will love running through in the Texas heat.